With the Passat achieving the 30 million production milestone, it has now become one of the best-selling Volkswagens of all time – second only to the Golf. 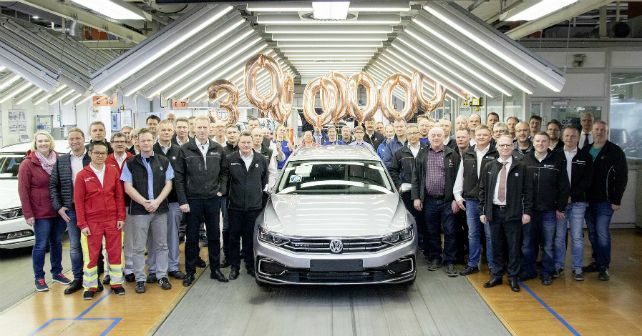 Volkswagen proudly rolled out the 30-millionth Passat from its production facility in Emden, Germany. The car in question was the Passat GTE wagon trim, which will be used as a test drive vehicle for international media. With this milestone, the Passat overtakes the Beetle as the second best-selling Volkswagen in history, with the Golf leading the charts. Volkswagen brought the Passat into production in 1973 as a successor to the Volkswagen 1600. Currently, the car is produced in 10 plants across the globe and sold in more than 100 countries. The Passat is offered in various versions and different body styles across the globe. For instance, certain markets abroad get estate versions of the Passat, but here in India, we only get it in the saloon form. The 2020 Passat broke cover at the Detroit Auto Show earlier this year. The car is expected to go on sale in the European market next month, albeit in a marginally tweaked form. This eighth-generation Passat has been packed with a lot of technology, including Volkswagen’s Travel Assist feature, which can semi-autonomously drive the car with the assistance from adaptive cruise control and lane keeping aid. Other features on the new Passat include matrix LED headlamps and VW’s new MIB3 infotainment module with wireless Apple CarPlay. As of now, there is no news about the updated Passat’s entry into India.